The trouble I have with being a creative person, is that I tend to be all over the place. I have always been a Jack of All trades, so to speak… the Master, however, is up for debate. Prepping for the Oil Party!! 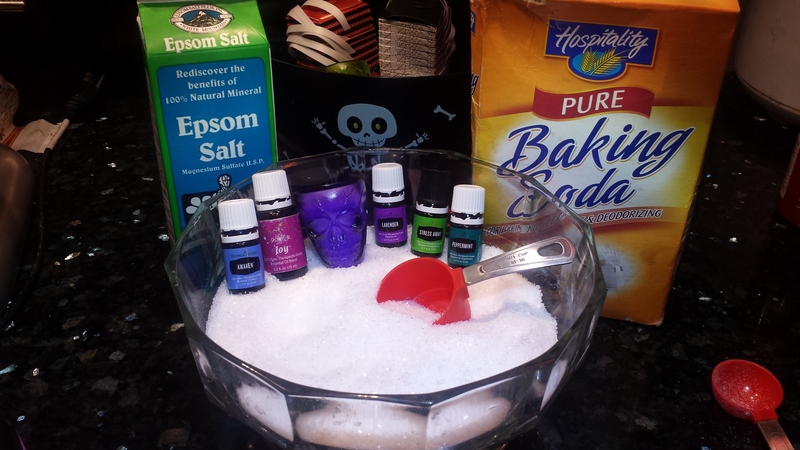 The Make and Take Station for bath salts! working on 3, out of 5 personalized crochet orders for my Crochet Shop. sitting on my Surrogacy Play, I’ve been working on the last year-that SERIOUSLY needs to be finished! Did I mention I have a FULL-TIME JOB!?! That job, is not including any of those things. Unless you can count inviting and/or sharing my absolute adoration for essential oils with my co-workers!! while my girls were in Gymnastics. This was after a hectic rushed hour: Leaving work to rush home, picking up one kid who wasn’t dressed, then to the elementary school to pick up the other- who somehow managed to not have her gymnastics outfit in her backpack (I put it in there that very morning!! ), so we had to buy one at the gym and she had to get change in the bathroom! UGH!! Its kind of a running joke in my house, how much mom can multitask in an hour. So for instance, from 5pm (the time I am back in Chula Vista after leaving work) I can usually pick up the big kids, stop at Target, stop at Sprouts and get gas by 6pm, in time to pick up LAyla, then head home. We call it speed shopping. In that same hour, Dad would’ve came home, checked the mail, sat on the toilet and MAYBE, went outside to smoke a cigarette. I digress…back to my creative endeavors. Are all of these creative opportunities just me cycling through some type of mania? It goes in waves. Sometimes I crochet compulsively, read compulsively, focus on dieting/exercise compulsively… you get the point. And then other times, its like pulling teeth to stay on task. ADD much? But I manage to pull it together and get things done… eventually. This is where this blog has helped! I keep thinking of new topics and what should I explore today? What would anyone care to read (and should I care?). Alas, I have started thinking that maybe these waves of creativity, this “Octopus arms in 8 different directions mama” may very well, not be having a mental health episode…. Maybe, just maybe, Its all in the name of PROCRASTINATION!?! Let’s explore the evidence: I don’t have enough focus to stay on tasks from start to finish, I have multiple things going at once, I start new tasks before I finish the current ones, I make to do lists, I clean up/organize my supplies, I stop to share my passions with others, I work better under pressure and with a deadline looming..…. It all adds up. Can Procrastination be my CREATIVE MUSE??? ABSOLUTELY!!! I get some of my best ideas when I’m totally supposed to be doing something else!!! Holy hell! Not sure if this is horrible or an amazing!?! We shall see, at the very least it is amusing. Always multi-tasking. Working on my oils order and a pair of monster pants! I am in awe of your creativity and how much you get done! To my amazing baby sister Krystal. I am so proud of you and love reading your blogs. To my amazing sister Krystal. I am so proud of you. I love reading your blog. Hey I was on your couch when you were doing all of this lol!